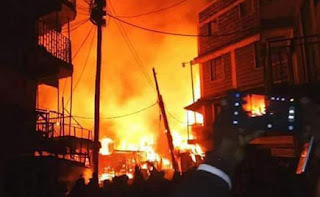 Kenya police has confirmed that at least 15 people are feared dead and unknown numbers are injured in deadly fire that gutted Nairobi’s Gikomba market one the country biggest market. The number of the injured is said to be over 60. The fire started at around 1am at Kwa Mbao area, before spreading to other parts of the informal market. According to Kenya Red cross some of the victims were burned while others choked after inhaling poisonous fumes. By 7.30am, firefighters from Nairobi City County Fire Brigade were still battling to extguish fire.